Thank you to all the folks at Resolve To Win. You guys have put the biggest smile on my face the past few days. You guys truly rock! The lame stream media hasn’t given you the coverage it should have, but your cause is just. This came from a friend of mine in email and I am posting it here with his permission…. some coffee and Mountain Dew and intended to welcome the walkers to Virginia by escorting them across the state line. in Halifax County. There, in a light drizzle, we met up with walkers Dennis McCool, Carl Heerup and Marc Breslow, plus their support crew (Ada, Don, Carl, Pearl – my apologies if I missed anyone). We learned the unfortunate news that Marc, after walking seven consecutive days, was going to depart for much-needed medical attention on his feet. So the core group of four was down to two (Dennis and Carl). The fourth member, an Army major or lieutenant colonel and Dennis’ son Gerry McCool, walked for several days in the beginning before needing to return to work. However, he will rejoin the group for the last few days. The group wished Marc a fond farewell, a speedy recovery, and plans to see him in D.C. on March 16th. a half-hour afternoon break, with each day completed about 6:00 p.m.
During the first leg Bob called in to a Richmond radio station, and the DJs interviewed Bob and Carl. Dennis normally receives a daily morning call from a Fox affiliate in Orlando FL that has been tracking their progress. However, this morning for some reason there was no call. People took turns carrying the American flag and the guidon (a long wooden stick with a metal pike on top, holding a small banner usually denoting a particular unit. This blue banner with fringe says Resolve to Win.) Since the recruiters and Larry were only planning to walk until lunch, I held off carrying the guidon until the later legs. We walked along the right edge of Hwy 301 and were blessed to have NC sheriff and police escorts all the way to the lunch break. 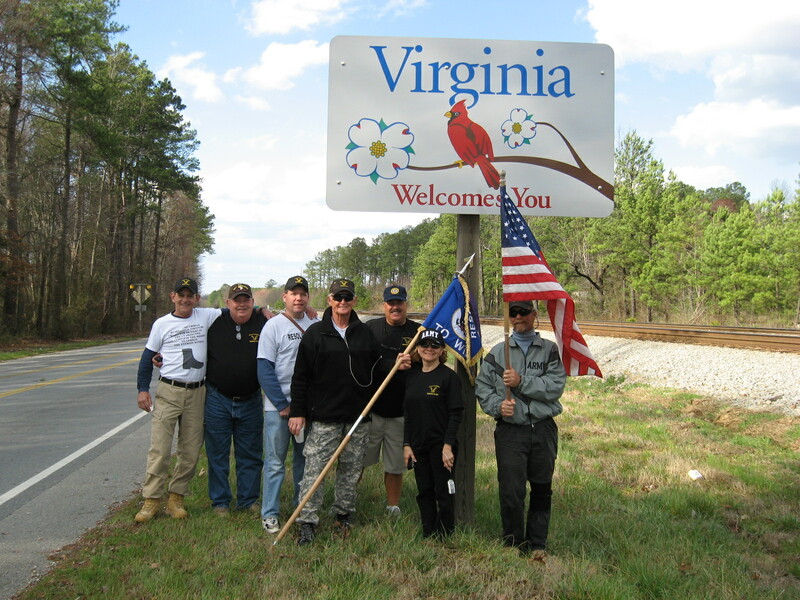 I was disappointed that Virginia did not have anyone (police or otherwise) greeting us at the state line. But the support crew and walkers all have Nextel phones, so they managed traffic very professionally with no significant problems all day. During the second leg we heard a disturbance behind us, and saw an elderly veteran with an American flag double timing (running) to catch up to us. We slowed down, and he walked with Dennis McCool up to a bridge (where his wife picked him up) just to show us his support. Very motivating! And during this leg another gentleman pulled his southbound vehicle over, jumped out, snapped a couple of photos and thanked us for walking. The rain cleared up after the first leg, and by lunchtime the sun was coming out. A reporter from Littleton NC took pictures and interviewed some of the folks. We ate and then bid a fond farewell to our Army recruiter friends, Darrick and Trey, as they had to prepare for an ROTC ball that evening. Both were fun to have around, sharing knowledge of the local area, trail mix and Hershey’s kisses! And Darrick kindly gave me a pair of hiking socks. I had neglected to bring a back-up pair, and the wet shoes & socks resulted in a couple of blisters on my right foot by lunch. So those socks did considerably cut down on my discomfort. Larry was feeling pretty good, so he wanted to walk the third leg with us. His wife Lori, following in a support vehicle, good naturedly agreed to go to work a little later so Larry could have some more fun with us (in a masochistic sort of way). muscles for a while. True to their word, they were waiting for us at the state line. They bought a load of shirts and hats and spoke for a while with Dennis. Dennis gave me some moleskin which helped considerably. gracious enough to run Bob back to retrieve my vehicle at the starting point. That enabled me to walk the final leg with Dennis and Carl, who otherwise would have been alone. Most of our route paralleled railroad tracks, and the trains were all honking, so we surmised they were talking about our march on the radio. I started carrying the guidon early in Leg 3, and never gave it up after that. Leg 4 was extremely windy, and the fairly comfortable temperatures from the morning had dropped a good 15-20 degrees. My hands were cold, but not enough to retrieve my gloves from the trail vehicle. We heard via radio there were gale warnings in the area. We weren’t surprised! Early in Leg 4 we heard a snap, looked ahead about 40-50 yards as the crown of an old tree plummeted into the roadway. Fortunately it was on the other side of the highway and no cars were coming. I quickly cleared the debris and we continued. We saw homes with shingles missing and at least two sheds with the roofs peeled back like tin can tops. Needless to say, managing the guidon and American flag in those conditions was challenging. Twice (during Legs 2 and 4) the American flag separated from the pole and was retired to the support vehicles. American Legion and Veterans of Foreign Wars posts. We then said our goodbyes and everyone departed. Don, one of the support crew, said Day 8 was the most challenging with the rain and wind, so I was especially glad to have joined these fine folks on this day and hopefully provided some good company and encouragement. As Bob drove me back to retrieve my vehicle, the first song coming from the radio was Alan Jackson’s “Where We You (When the World Stop Turning,” a moving reminder of the horrible slaughter of 9/11/01 and its impact on our lives. A very fitting ending to an amazing day dedicated to our troops. • consider meeting them somewhere between Emporia and D.C. through March 16th. Maybe YOU could be one of the thousands they hope to have escorting them over the Memorial Bridge from Arlington National Cemetery to the Lincoln Memorial on March 16th. God willing, I’ll be there. Rock on, Eric! We need more like ya!